How often does this question come up? I hear Brokers and clients alike talking casually about this topic daily. The housing bubble is a period in history, like in 2007 in the U.S. market, when housing prices soar above average. Following, there is often an increase in the supply of homes, but a decrease in demand. It can be caused by a number of reasons: speculation, demand, etc. This can cause the market activity to slow and become stagnant. 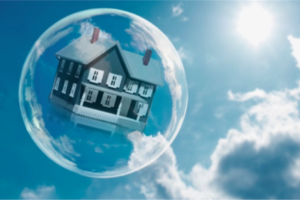 There are no guarantees in whether there will or will not be a “housing bubble”. Some say you can expect to see one in 2019. Others are not so supportive of that evaluation. ” The economy remains strong, and housing will continue to see stable growth, Lawrence Yun, chief economist for the National Association of REALTORS®, predicted Friday at the REALTORS® Conference & Expo in Boston. Yun forecasted about 6 million new- and existing-home sales by the end of 2018 and slightly more than that each year for the next two years. Home prices will also see modest growth—about 4.7 percent this year, 3.1 percent in 2019, and 2.7 percent in 2020. These healthy trends, however, depend on homebuilders adding new inventory to keep pace with expected increases in demand. Nationally, builders are adding about 1.2 million homes a year, still below the historical norm and significantly below the 1.9 million that came on the market during the real estate peak in 2004. Yun said he sees no signs of a housing bubble, even though home prices have been outpacing income for many years. That’s because the economy remains fundamentally sound, mortgage quality is high, and with inventory shortages persisting in some markets, there’s none of the overbuilding that characterized the run-up to the Great Recession. Still, there are risks. An international trade war could stall economic growth, short-term interest rates could rise above those for long-term debt instruments—signaling a precursor to recession—and consumer pessimism could have a dampening effect on the economy. Yun said REALTORS® can play a role in tackling the last concern by reassuring consumers that the economy remains healthy and all signs point to positive home price gains. He said he doesn’t see a recession happening because inflation appears to be under control, so the Federal Reserve is likely to be moderate in any short-term interest rate increases in the next year or so. Bottom lime: It’s a good time for people to buy. “All indications are prices will keep moving higher, and buyers who wait risk missing out on wealth gains,” he said. Keep in mind, even during the ‘crash’ of 2007, people were still buying and selling homes. The housing market is quite often dictated by consumer activity. As the economy remains strong, so will the housing market.